We’d aimed to catch up with Michael Vergers sooner than this – after his stunning drive at Istanbul. So what about Istanbul, and Michael’s drive in the Barazi-Epsilon Courage? That dropped the Barazi-Epsilon Courage outside the top ten – but not for long: Vergers was on another charge. Only Gounon was faster than the black, white and red Courage at this stage (not always though), and that early stop was paying massive dividends. Once Minassian stopped for slicks, he was into the 1:46s, but Vergers was lapping in 1:47, and on lap 16 he passed the #37 Belmondo Courage (yet to pit) for the P2 lead. Didier Andre was still out on his wets, and the lap time difference between these two cars was typically nine seconds at this stage. Andre pitted after 18 laps – and we were now set for the #32 Courage AER to lead the whole of the rest of the P2 race… helped in no small part by Vergers’ pace. He set the fastest race lap (so far) on lap 20, a 1:46.422 – 15 thousandths quicker than Collard’s nineteenth lap, and about 0.15 quicker than Minassian’s thirteenth. 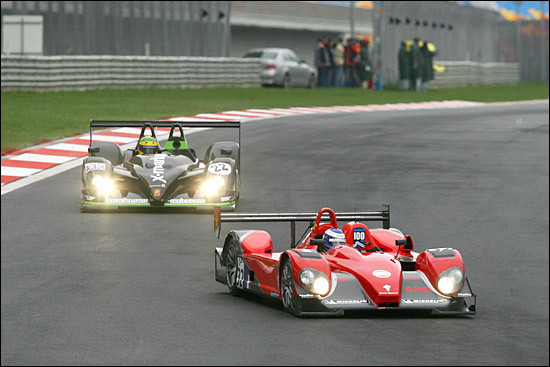 The Creation driver would soon be into the high 1:43s.. but Vergers was romping away from everyone in P2 (although the Radical was faster on some laps – but after that car’s early delay, the gap between these two grew from just about four minutes on lap 11 to four minutes and nine seconds on lap 24). GT2 de Simone to Bleekemolen 60 seconds. 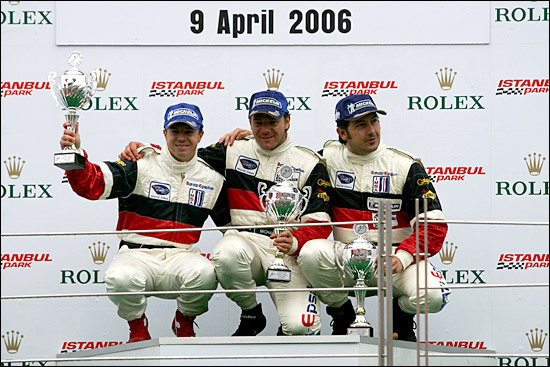 Whatever was about to happen to the race length in Turkey, this was already an extraordinary endurance race. Michael Vergers was the only class leader (who had pulled out a big gap on his rivals) without the advantage of starting on slicks. .. and he had a misfire. Without the dramas afflicting RML and Rollcentre, it would have been a different opening phase in the P2 race, but boy did Michael Vergers ‘go for it’. “We’d had endless problems with the wiring on Friday – and really these carried over from Sebring, where we’d struggled to finish. It was a slightly different problem in Turkey, and we only really cured it in qualifying on Saturday afternoon (#32 was third quickest in P2 with a 1:43.820, behind Erdos (1:42.336) and Barbosa (1:43.359). 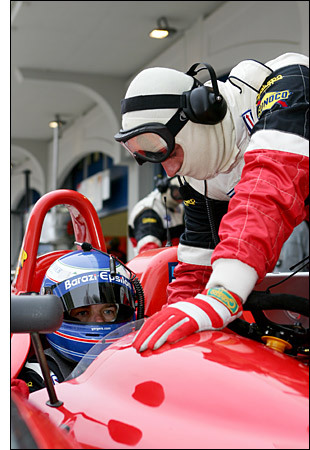 “But then it came back for the race – although it didn’t cost us a lot of time. It came in at 5,200 revs, so as long as you kept the revs up, beyond that, it wasn’t a problem. It was a problem at the tight turn 1 though, where we’d be stuttering and the GT1s would come past. Michel Lecomte and his Epsilon mechanics had been working long hours on the wiring loom – both in Florida and Turkey – but the permanent fix seems to be in place for Spa. Back to the race – and Vergers completed his Turkish Delight after 70 laps at the wheel (with a refuelling stop after 36 laps). 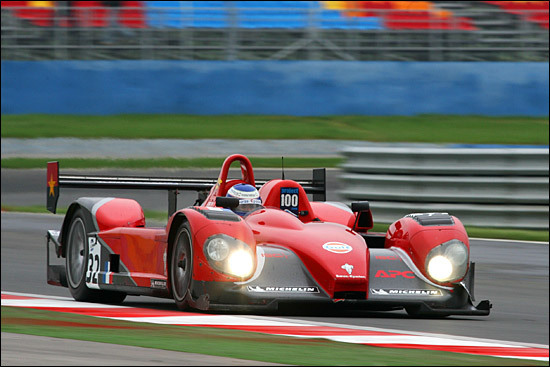 The Radical had cut the gap to three and a half minutes at this stage, but #32 was second overall, after the retirement of the Creation. “Juan’s business commitments, plus the travelling time for the car (to Sebring, back to Europe then on to Istanbul) haven’t allowed any testing time, but he’s getting more used to the downforce and braking. He did a great job at Istanbul though: he knows he can go faster, but he concentrated on keeping it going. By that stage of the race, there was no threat from behind, the Radical still being a minute and three-quarters behind – and then sadly, after 120 laps, Tim Greaves pulled off, leaving the Pilbeam to take second in class, and Ed Morris to take third in the next best placed Courage. 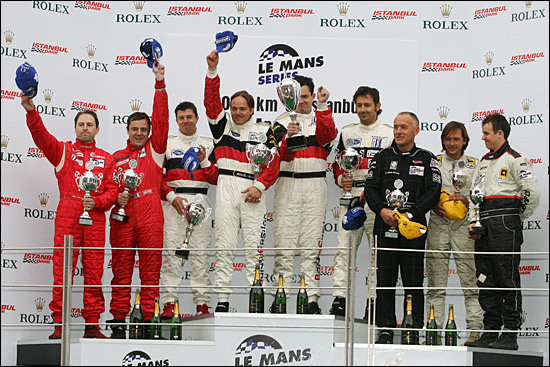 Look at Michael Vergers' body language (fourth from the left) on the podium - with Epsilon's Christophe (the tall guy) showing more 'victory emotion' than either Jean-Philippe Belloc or Juan Barazi. So P2 cars took second overall at Sebring and Istanbul. Neither the Intersport nor Barazi-Epsilon cars were the fastest in their class, but both entries had superb runs (over 12 and four hours respectively). Jon Field had stormed through the field, from the back, in the opening stint at Sebring, while Michael Vergers had done it rather differently – from the front.